Harrington's SNER electric chain hoists are built for extreme duty applications that require single phase power. 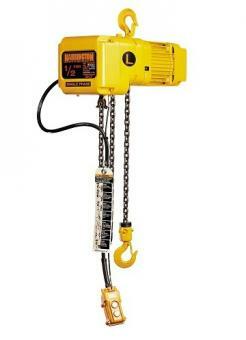 A hoist with a 60 minute, H4 duty rated motor is revolutionary and unmatched in a single phase offering. Maintenance friendly features include a unique chain guide, hinged control panel, sealed housing and durable load sheave. For beam travel requirements couple with SMR motorized, PT manual push and GT manual geared trolleys.